There are many old stuff that we can give them a new life with some creative upcycled ideas nowadays. For example, an easy DIY lightbulb project. Turn your old but not broken lightbulb into a house plant. This project is easy to do and you can use them as decorations for your home, and plus, they can fit easily in many different space and will look interesting in the same times. 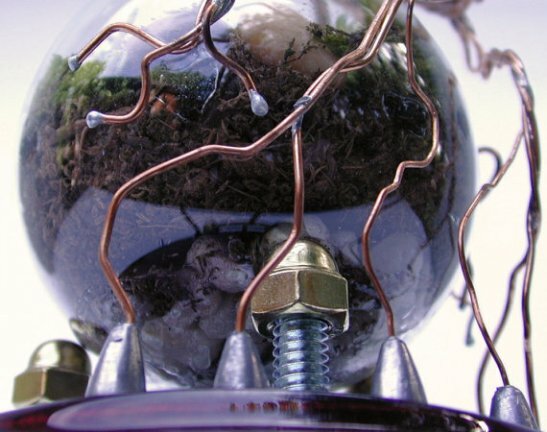 Be creative using screws, nuts, bolts and bent copper wire to make this steampunk-style light bulb for your terrarium. This light bulb conventional plant pot are filled with a clear glowing gel, so you can watch the roots while they are growing. Stained the light bulb glass and this purple and silver stained glass is perfect for your terrarium. Create an incredible entire landscape inside light bulbs such as this Tiny Terras. This is perfect for your office decoration or even a gift for your love one. This light bulb living diorama is consist of a balanced mix of mosses, river stones, lichens and bark inside clear glass bulb. This cool stand made from a pieces of old copper wire will caught everyone’s eye. Just twist the copper wire a bit and this cool stand is ready to hold your light bulb plant pot. Light bulbs are perfect for tiny plants especially for terrarium that need a humid condition such as inside the light bulb. This is the perfect economical yet stylish DIY project that only need a light bulb and moss from your backyard. Placed the plants in the bulb vase, watered it and forget about it for a while, and roots will grow and even developed small, whitish flowers in it. This light bulb project is so beautiful. Fill the light bulb with soil and wood chips to make your small garden light bulb look like a fantasy world in a real world. Just bent little hooks at the ends of the wire to hold the bulb through the holes in the fitting (be careful not to break the glass while doing this) and make sure to change this bulb vase’s water frequently.